In the center of the disc - the indication of the face value of the coin "10 РУБЛЕЙ" (10 RUBLES). 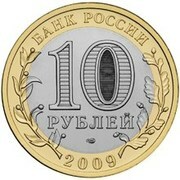 Inside of the figure "0" - hidden pictures of the figure "10" and of the inscription "РУБ" (RUB) visible by turns on changing angle of vision. In the lower part of the disc - the mint trade mark. 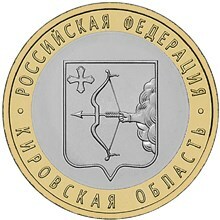 In the upper part of the ring - the inscription along the rim: "БАНК РОССИИ" (BANK OF RUSSIA), in the lower one - the year of issue "2009", to the left and to the right - stylized twigs of plants going over to the disc. The image of the coat of arms of the Kirovsk Region. The inscriptions along the rim: above - "РОССИЙСКАЯ ФЕДЕРАЦИЯ" (THE RUSSIAN FEDERATION), below - "КИРОВСКАЯ ОБЛАСТЬ" (THE KIROV REGION). Note that the region is called Kirov Oblast, not Kirovsk Oblast. The confusion in some sources is related to the fact that the adjective Кировская (Kirovskaya), being the Russian name of the region, can be derived both from Kirov (a large city) and Kirovsk (a small town in Leningrad Region, as well as some other towns and settlements).